The book does an admirable job of focusing on the three key factors that could lead to the resurgence of the middle class. Munir Moon’s perceptive book, The Middle Class Comeback, offers a realistic but decidedly optimistic view of the future of America’s middle class. The plight of the middle class is invoked time and again in political speeches and economic reports, though without producing a broad solution to the situations facing such Americans, including falling incomes and higher costs. Moon’s clear, concise, and well-researched work defies common pronouncements, suggesting that the middle class may be troubled, but it will make a comeback because of three specific factors: women, millennials, and technology. Each of these three areas is explored in a fair amount of detail, though the book devotes the most time to addressing the specific impact of women. Shared statistics demonstrate the rising power of women, who now account for almost half of the labor force and outnumber men two-to-one in earning four-year college degrees. The text includes appropriate discussions of women’s roles in American society, citing numerous prominent women in business, technology, and politics. The impact of millennials is shown to be no less significant, especially with regard to “transforming existing industries while creating new ones.” Politically, “about half describe themselves as politically independent,” which Moon suggests could have fairly dramatic implications in future elections. The book includes numerous sage observations about the changing economy, with particular focus given to the “sharing economy” and the “flexible workforce.” It also offers a sweeping overview of aspects of America’s health-care, education, and tax systems. While the book’s broad brush approach is more conceptual in nature, it provides specific recommendations for modifications that could contribute to middle class salvation. In the area of taxes, for example, it suggests significant revisions to the tax code to reduce personal taxes and eliminate corporate loopholes. It is Moon’s coverage of the political environment that probably stands to resonate most strongly, especially during a presidential election year. Referring to Washington, he writes, “The Beltway is the biggest impediment to economic growth and the main obstacle to the middle class comeback.” He explores some of the reasons for political gridlock and proposes “a platform for ‘Rebuilding the American Middle Class’” that includes setting term limits on representatives and senators and reforming the tax system. 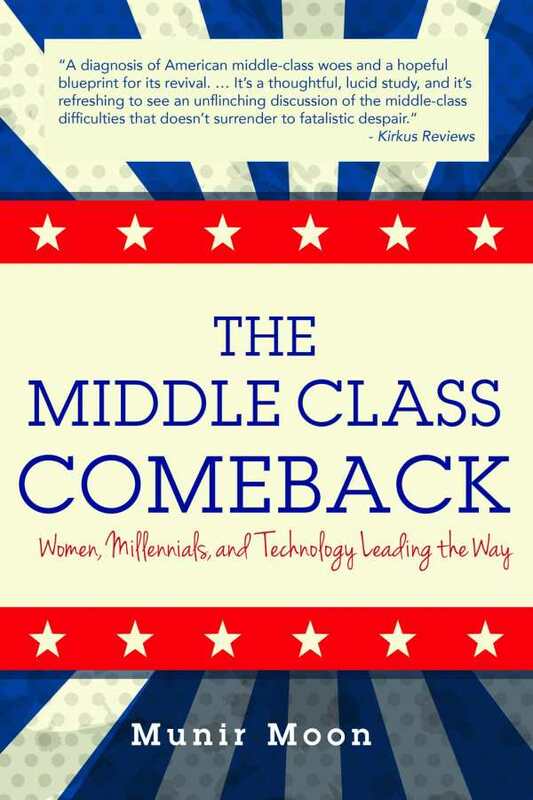 The Middle Class Comeback is smart, succinct, and easy to read, yet it proactively addresses some of this country’s most pressing problems. In a relatively short work, Munir Moon has done an admirable job of focusing on the three key factors that he believes will lead to the resurgence of the middle class. One can only hope he is right.